Are you ready to become an Agent of Compassion? 1) Use everyday moments as opportunities to spread the antidote and create a culture of compassion, one act of kindness at a time! Agents can acknowledge and tell the stories of the daily acts of kindness they witness in their lives. Report back to HeartQuarters using the Compassion Report Map to share the stories of compassion in action, elevating your compassion to inspire others! 2) Rally your friends and form a team to organize a service project in your community, and challenge others to join you! 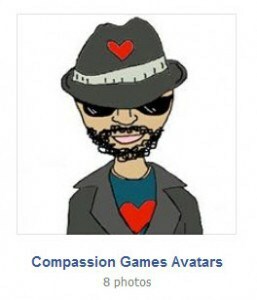 3) Participate in a Compassion Games coopetition to play with others from around the world! These events happen throughout the year… sign up to stay tuned and learn about upcoming coopetitions! 4) Help us grow the International Kindness Team! Use the instructions below to sign up to become an Agent of Compassion, and then recruit your friends to become Agents as well! Using the form below, sign yourself up to become a Secret Agent of Compassion! After you sign up, you will also be able to invite your friends to join you as a member of the International Kindness Team, too! After you sign in, you are offered sharing tools to reach out to your friends that are simple, safe, and effective. It connects to your address books and friend lists, and lets you choose who you invite in a secure way. Still have a question? Watch this tutorial video to learn more. Read the email that is sent with your personalized message here. Secret Missions During the Upcoming Giving Games! 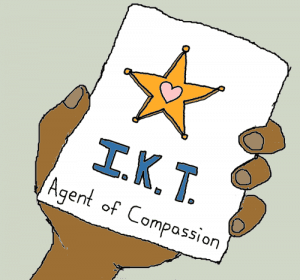 IKT Director Andy Smallman will be sending daily mission briefings for 11 days to all Agents with inspirations for compassionate action in the Giving Games, beginning on December 1st and going through December 11th. Use your creativity and adaptability to find a way to fulfill your mission… No kind act is too small to have a huge impact! Your mission briefings will help you practice an attitude of compassion, and discover that even the simple actions of Secret Agents can be profoundly world-changing. If you choose to, you can adopt a new identity online during the Giving Games by changing your profile photo. Click on the photo below to link to an album of avatars you can choose from. To access the archive of previous missions you can visit the International Kindness Team Headquarters. To find out more about the history and origins of the Secret Agents of Compassion, check out Andy Smallman’s Kindness Classes at kindliving.net. 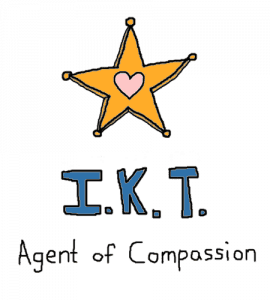 You can also read about the International Kindness Team in the following story “Secrets Revealed: Anonymous Agent Spills the Beans on the Secret Agents of Compassion”.